Union Pacific Big Boy 4012 was one of twenty-five 4-8-8-4 locomotives built by ALCO for the Union Pacific. There are eight of them on display in the United States. 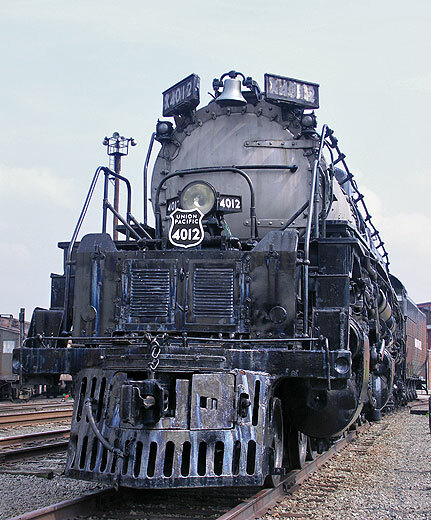 This one, 4012, on display at Steamtown was presented to F. Nelson Blount by the UP Railroad in the first half of the 1960s when Steamtown, USA was located in Bellows Falls, Vermont. The overall length of this locomotive is 132 feet, 9-1/4 inches. It was retired by the Union Pacific in February 1962 after logging 1,029,507 miles. The locomotive cost the UP $265,000 when it was built in the 1940s. The train weighs 1,189,500 pounds and was operated at speeds of up to 80 miles per hour.